2012 Vincent Girardin Puligny-Montrachet - a hint of toast, a bit flinty, with lemon. 2012 Vincent Girardin Chassagne-Montrachet - nose was more open, with more toast, more lemon, and more flint. Sharper nose, with more acidity here but reasonably round on the palate. 2012 Vincent Girardin Meursault - more flint here, a little pungent. Leaner on the palate, with good acidity balance. 2012 Vincent Girardin Chassagne-Montrachet 1er Cru Le Cailleret - nose was more open and beautiful, with more butter, vanilla, and ripeness. 2012 Vincent Girardin Corton-Charlemagne - more sweetness and ripeness, beautiful! Bigger nose of toast. 2012 Les Héritiers du Comte Lafon Mâcon-Uchizy - fruitier, more tropical, with flint. Slightly lean on the grippy finish. 2012 Les Héritiers du Comte Lafon Mâcon-Milly-Lamartine - more pungent with lots of oak, slightly rounder on the palate. 2012 Comte Lafon Meursault 1er Cru Charmes - nice nose of lemon citrus, a bit of toast and flint. Kinda lean on the palate. 2013 Beaucastel Châteauneuf-du-Pape Blanc - very sweet and tropical nose of peach and lychees, with some minerals. A little ripe on the palate. 2012 Beaucastel Châteauneuf-du-Pape Blanc - bigger nose, more pungent, less fruit but still with lychee and stone fruit notes. Rounder and sweeter on the palate. 2012 Les Hauts de Smith Blanc - lemon, pipi de chat, muscat grapes, minerals, and flinty. First whiff was pungent, then suddenly very perfumed. Light and lovely on the palate. 2012 Smith-Haut-Lafitte Blanc - nose was more open and elegant, with lemon, muscat grape, and a bit of pipi de chat but less pungent. Nice and buttery. 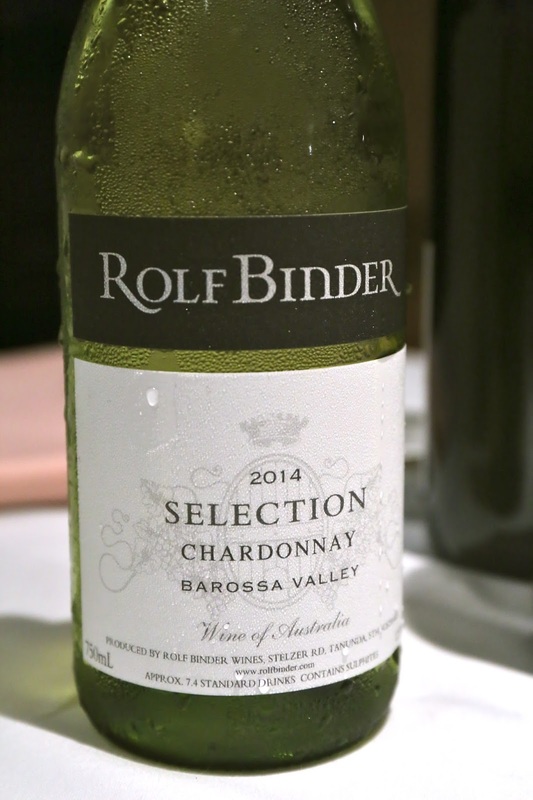 2014 Rolf Binder Chardonnay Selection - very oaky, with lots of vanilla and toast, very ripe and sweet, and very tropical nose. 2014 Burge Family Semillon Olive Hill - a little sharp, some plastic notes, a bit metallic, crisp with good acidity balance. 2010 Burge Family Semillon Olive Hill - much bigger nose of plastic and wax, a little flinty. Really good balance on the palate. 2014 Peter Michael L'Après-Midi - still very new, nose was not quite balanced and a little out of joint. Oaky with vanilla notes. 2013 Peter Michael La Carrière - sweet nose with tropical stone fruits, mineral. A little bitter finish. 2013 Peter Michael Ma Belle-Fille - toasty, buttery, very ripe. Nice and sweet on the palate. 2002 Salon - nose was nice and sweet, and caramelized, with nice toast. 2008 Pol Roger Blanc de Blancs - nice mousse, with caramelized nose and nice toast. Sweeter than expected for a blanc de blancs. 2004 Pol Roger Brut - lots of toast, nutty, caramelized with notes of Chinese licorice, nice and mineral, almost salty plum. Drinking beautifully now. 2006 Pol Roger Rosé - moussy. This was OK.
Pol Roger Rich - a demi-sec. Definitely richer and sweeter on the palate. 2011 BOND St. Eden - a little young. Oaky, a little bit of smoke, sweet. Lovely. 2011 BOND Quella - softer, more fragrant, oaky, and sweet. 2011 BOND Vecina - oaky, sweet and ripe on the palate. 2011 Peter Michael Les Pavots - served from decanter. Very fragrant, with smoky and leather notes. 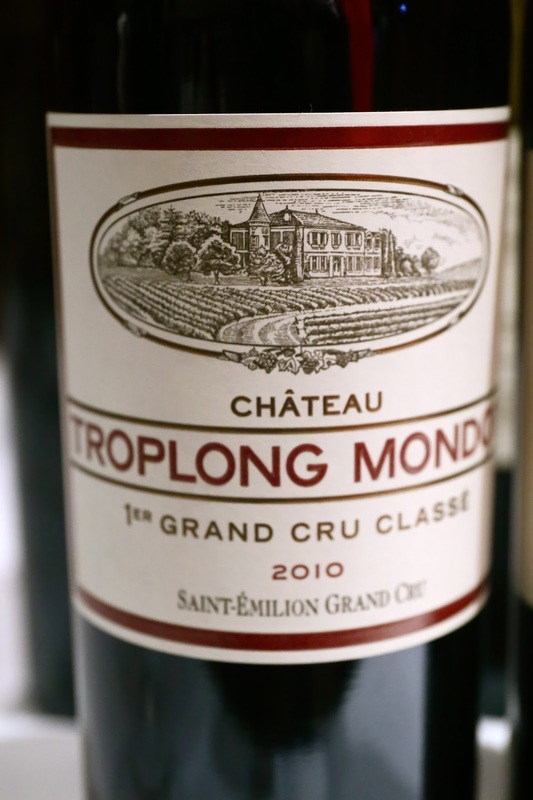 2010 Troplong Mondot - very fragrant with cedar notes. 2006 Climens - nice and grapey, with plenty of honey and marmalade.